Saturday night sees Wisconsin take on Michigan in a match that provides a tantalising number of markets for NCAA football punters. While Wisconsin is coming off a win, the 41-24 triumph over the winless Nebraska was not that impressive. They are 2-0 in Big 10 play and all-alone in first place in the West Division. The Badgers don’t have to face Ohio State this season, but this game is a big one for them and they still have to hit the road to face Penn State, who are currently the 8th ranked team in the nation. Michigan is tied with Ohio State, who they face in their last game of the season, at 3-0 and in first place in the Big 10 East Division. They have the top-ranked defense in the nation and that D will be tested in this game by a Wisconsin team that ranks 4th in the nation in rushing yards per game. 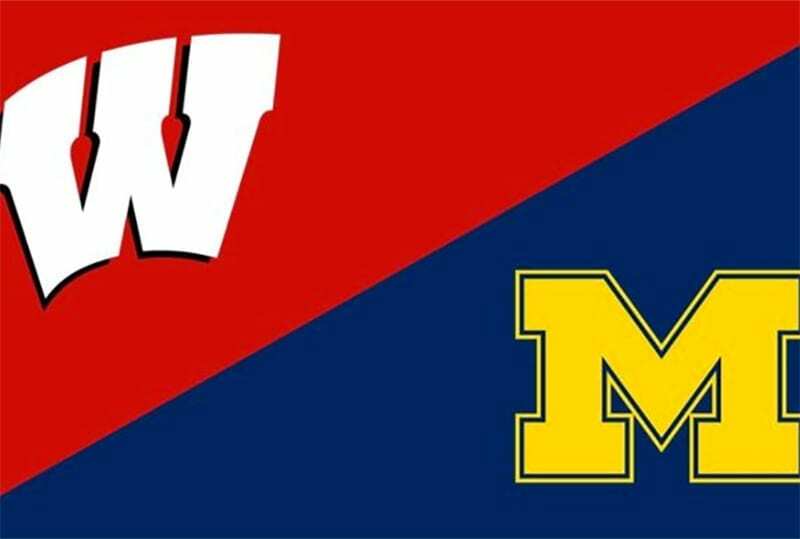 This season Wisconsin is 4-1 SU with an ATS record of 1-4 and an O/U record of 3-2 and Michigan is 5-1 with an ATS record of 3-3 and an O/U record of 3-3. Wisconsin is 9-1-1 ATS in the last 11 games between these Big 10 rivals. Last season at Wisconsin the Badgers beat the Wolverines 14-7. The Badgers have the nation’s fourth best rushing offense and they will be facing a Michigan run defense that ranks sixth in the nation. The Wisconsin ground game is key, as they are not a big passing team only ranking 102nd in the nation in passing yards per game. Jonathan Taylor is the guy that the Wolverines have to try to stop, but he has rushed for over 100 yards in every game this season and on top of that in Wisconsin’s last game he rushed for 221 yards. Wisconsin beat Nebraska 41-24 in their last game where Taylor went big and had to since the Badgers’ defense gave up 518 total yards including 407 passing yards. Alex Hornibrook has been pretty good under center for the Badgers, but he has only passed for over 200 yards in two games this season. Michigan is coming off a 42-21 win over Maryland in their last game where they had 465 yards and held the Terrapins to only 220 yards. The Wolverine’s strength is also the ground game ranking 42nd in the nation in rushing yards per game and they rank 81st in passing yards per game. Senior RB Karan Higdon leads the Wolverines in rushing on the season and in his last four games he has topped 100 rushing yards. In the win over Maryland Shea Patterson passed for 282 yards with three touchdowns and one interception. Patterson may be called on more in this game, as the Badgers secondary was torched in their last game and they rank 54th in the nation in pass defense. Wisconsin ranks a solid 25th in the nation in run defense and in their last game facing Nebraska they gave up 111 rushing yards. Wisconsin did not have the most impressive game in its last one and have to shore up its defense for this game. That will not happen. Wisconsin will struggle defensively again and while Taylor may have a good game on the ground, it will not be enough. Michigan will win and cover at home and send Wisconsin to their first Big 10 loss of the season.